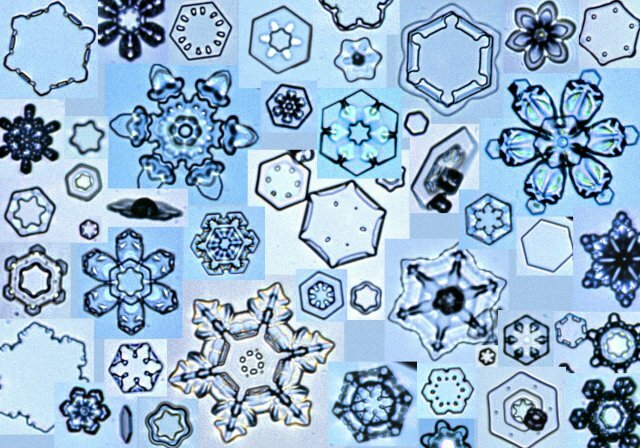 Snowflakes and snow crystals are made of ice, and pretty much nothing more. A snow crystal, as the name implies, is a single crystal of ice. A snowflake is a more general term; it can mean an individual snow crystal, or a few snow crystals stuck together, or large agglomerations of snow crystals that form "puff-balls" that float down from the clouds... The water molecules in an ice crystal form a hexagonal lattice... There are two hydrogens for each oxygen, so the chemical formula is H2O. The six-fold symmetry of snow crystals ultimately derives from the six-fold symmetry of the ice crystal lattice. In October I was in Northern Italy and visited the walled city of Palmanova with Branner fellow Nicolette Mastrangelo. The fortress, curiously enough, is a hexagon at the center and contains nine points. The logic is that a commander at the center can view the action on the ramparts and direct the cannon reinforcements with utmost speed. Contrary to what the plan might suggest, this is not a panoptic system in the pure sense. The commander at the center can't actually see over the ramparts - to build such a tower would be to invite decapitation. However, walled cities did function to project power over a large section of territory, which is a very panoptic concept. Imagine how the function of a walled city is now accomplished by satellites and drones today, a dramatic reduction in material though certainly not in engineering effort. How does this Caltech professor study snow crystals? The production of snow crystals also embodies an architecture. We learn that they are grown in a convection chamber, shown schematically below. 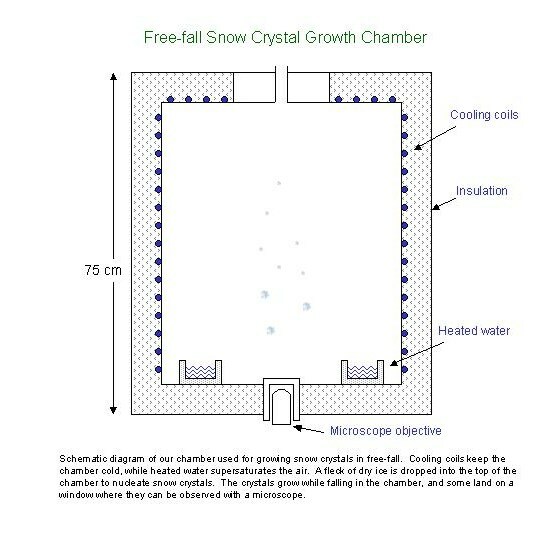 Basically it is just a cold chamber about a meter tall, with two containers of heated water on the bottom. Convection mixes the water vapor into the cold air, creating supersaturated air for growing snowflakes. We nucleate crystals by dropping a speck of dry ice in the chamber, or by rapidly expanding some cold compressed air inside the chamber. Happy Holidays everyone! And email me if you want the CAD file. snowflakes are symmetrical because the water molecule is also symmetrical. so if you check out anything in nature that contains water there is inherent symmetry. just wanted to share, great post. 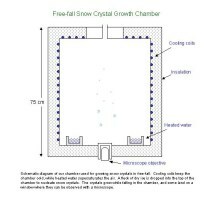 i have been to snowcrystals.com many times in the past so this was joyfully nostalgic for me. of course, my interests then were of complete geek fascination and not architectural, but i really enjoy this comparison. specifically, i find an interesting relationship between the nuclei of ice crystals (the central ingrediant that allows the process of ice nucleation to begin) and the commander in the semi-panoptic systems of the star forts. if you could grow cities in this way, you might be on to something..
great post. and I love your blog! I also found it interesting that the pentagon is a geometrical shape. Do you know anything about this? On another tangent: I once confused a pphotograph of Mecca with the Pentagon. Something about their exteriority made me mix them up. man, i love me some vauban. my dad dragged me to several of his fortifications as a kid. the vauban ornament is actually neuf-brisach. breisach (german) is a few klicks east of neuf-brisach on the other side of the rhine. i've been there several times. it's pretty cool - as an architect, but the city is dead. although i must say the ornament doesn't do the topography justice. it almost might be better done with a CNC to route out the fortifications and massive walls. i'd be really interested in the cad file as well. Awesome rightup...I survived this year, actually I lived this year. After looking back at photos and past blogs Ive written in various forums, it has been an eventful year. Thesis has been a rollercoaster of a ride.